RICHMOND, VA (December 13, 2012): The five ECNL National Events per year are a big deal for both the players and the clubs. For the players, it is a chance to play in front of dozens of college coaches at every game. For the teams, it is the opportunity to size up the competition from across the nation. The next ECNL Event is only a few weeks away and many teams have already played their final games before the big showcase. Find out who is going into Sanford, Florida Event with a hot streak in this week’s ECNL recap. Solar-Chelsea Soccer Club kept its top spot in the Texas Conference with a 4-0 win over Challenge SC on Sunday. Defender Hannah Webb scored her fifth goal of the season in the shutout victory. Webb also added an assist, as Taryn Torres, Mary Moore, and Rebecca Keane also found the back of the net in the win. Moore leads the team with 12 goals this season. FC Virginia’s Gabriella Gordon scored her eighth and ninth goals of the season on Saturday, as FC Virginia topped Freestate Alliance 3-1 in Midatlantic Conference Action. Casey Kent had the other goal for the winning side. FC Virginia (7-1-1) remains in second place in the conference behind Carmel United, which is 9-0-1 on the year. In the Southeast Conference, Gwinnett Soccer Association improved to 4-4-3 on the season with a 1-0 win over Birmingham United on Saturday. Amanda Baker with her fourth goal of the season proved to the difference in the fixture. Maya Boles had the assist. Concorde Fire picked up two big wins in the Southeast Conference over the weekend with shutout victories over Atlanta Fire and Gwinnett Soccer Association. On Saturday, Concorde beat Atlanta Fire 3-0 behind goals from Lily Ammon, Lily Barron, and Cayson Greene. Brook Colangelo, Emily Duner, and Claire Shea were credited with the assists. The next day Concorde notched a 2-0 win over GSA thanks to goals from Shea and Katie MacGinnitie. Colangelo added another assist in the second win of the weekend. Scorpions SC also had a six-point weekend with wins over Connecticut FC and Soccerplus Connecticut. On Saturday, Scorpions used goals from Michaela Webb and Allyson Reynolds to notch a 2-0 win over Connecticut FC. They followed up that performance with a 3-2 win on Sunday with Webb, Reynolds, andKelsey Gilbert scoring in that clash. Anna Haigh had two assists in Sunday’s clash. FC Bucks picked up their first win of the season Saturday with a 2-0 victory over FC Delco. Gabrielle Farrell and Emma Loving found the back of the net for the Bucks. Loving also had the assist on Farrell’s tally. World Class FC’s Kelsey Davis made sure her club’s ECNL season started with a bang. The forward notched three goals in two games over the weekend to lead the New York club to a pair of victories in its first and only action before the Showcase in Florida. Carly Glaser and Juliana Cabrera also had goals in the wins over Albertson Fury and East Meadow Soccer Club. Lonestar SC bounced out of its recent slump with a 4-0 win over FC Dallas on Saturday. The Texas club had only won one of its previous seven games prior to the weekend. Sophia Acedvedo scored twice in the shutout victory. Ohio Elite kept its undefeated start to the season alive, but there were some close calls over the weekend. On Saturday, Ohio Elite defeated McLean Youth Soccer 1-0 thanks to a goal from U.S. U14 Girls National Team forward Mary Vignola. Kaitlyn Bigner provided the assist for the youth national team striker who is playing up two ages. It was not all good news for Elite though. On Sunday, the Ohio club was held to a 1-1 draw with FC Virginia. Dallas Texas improved to 6-2-3 on the season with a 1-0 win over D’Feeters Soccer Club on Saturday.Jordan Connors scored the lone goal via an assist from Tori Gates. The Texans sit in fourth place in the Texas Conference with two games remaining before the Showcase in Florida. Atlanta Fire also had a good weekend with a pair of wins to push into third place in its conference. Danielle Marcano scored twice on Saturday in the 2-1 win over Concorde Fire. Atlanta came back with a 2-0 win on Sunday over Birmingham United. Ohio Elite’s quick strike offense and punishing defense was on display once again this weekend in a pair of shutout victories. On Saturday, Ohio Elite Soccer Academy defeated McLean Youth Soccer 2-0 with goals from Rachel Westerkamp and Wake Forest commit Maddie Huster. 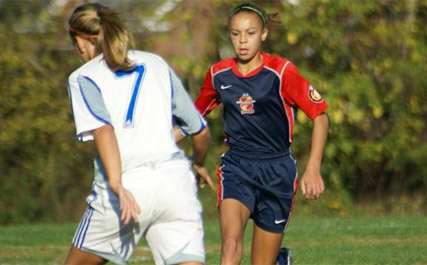 On Sunday, Ohio State commitSydney Dudley scored twice to lead Ohio Elite to a 3-0 win over FC Virginia. Cincinnati commit Lauren Heger had the other goal. Joelle Johnson continues to destroy defenses in the ECNL, as the top scorer on Sporting Blue Valley added two more goals to her season tally on Saturday. The Nebraska commit found the back of the net twice in a 3-2 win over SLSG. Johnson now has 17 goals in 11 games this season. UAB commit Sharon Osterbind scored twice on Saturday in a 4-2 win for Birmingham United over Gwinnett Soccer Association. Osterbind followed that up on Sunday with a game-winning assist to Sara Smeltzer in a 1-0 win over Atlanta Fire. Smeltzer, the Liberty commit, notched her fourth goal of the campaign.